August 2016 – Hello World! What do you do when a new GNOME Release hits? Could I possibly ask the Board for help? A dinner tradition in our house is to share three great things from our day. 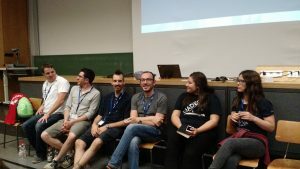 Being at GUADEC is making it hard to remember to do this, so I thought I would list them here. Not surprisingly, the kids loved Jonathan’s talk the most. It was a fascinating look into asynchronous internet and how much of the world do not live in areas with the infrastructure necessary to have a constant and fast internet connection. The Board met for lunch to make sure we were all on the same page with regards to how the AGM would go. The kässespaetzle was just a bonus. I love the AGM. It’s always great to see the presentations showing off how much has been done in the past year. The official presentation of the new Board of Directors and their offices lets the general membership the ability to match faces to the names they see and humanizes them. At the end of the question and answer section, the Board proudly presented the annual Thank You Pants to Alex Larsson. (For those following along, purchasing these pants was my super secret mission from Day 1.) Although only the Board knew who the recipient was ahead of time, it was obvious through the prolonged standing ovation that the general membership approved of the choice. The annual GNOME Women’s Dinner took place tonight and was planned by Marina and Moira Schuler. Much thanks to both of them! There were twelve women plus one youngster at dinner and we enjoyed wonderful food and conversation. It is always such an encouraging and supportive atmosphere. My daughter basked in it and came out of the evening convinced she can give a lightning talk herself. As her mom, I find this terrifying and yet am so proud of her for wanting to put herself out there. Maybe my referring to her as part of the far future yesterday was a bit premature! After spending Day -1 and Day 0 with the GNOME Board of Directors for the annual in-person meetings, GUADEC proper officially began today. With much excitement in the air, people were lined up out the door for registration. For us who have been around for a bit, it is always nice to be reminded of prior GUADECs. Shaun McCance evoked happy memories with his cheerful good morning to open up the conference. Bradley Kuhn’s keynote referred to past GUADECs he has attended. Coming up on GNOME’s 19th birthday, it is good to remember how we got here. 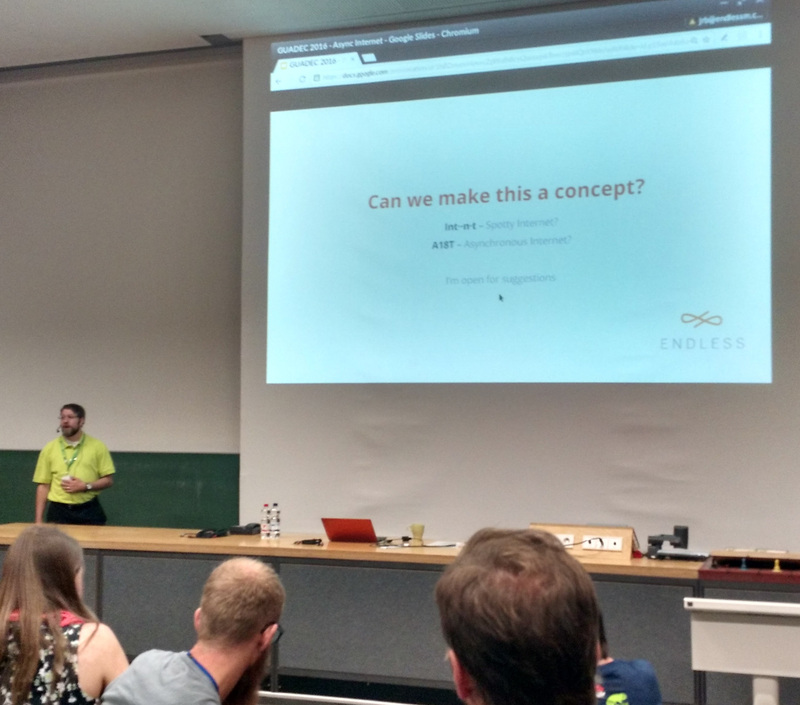 From the first talk (Alex Larsson’s talk on Flatpak), the first day of GUADEC moved at a quick clip. 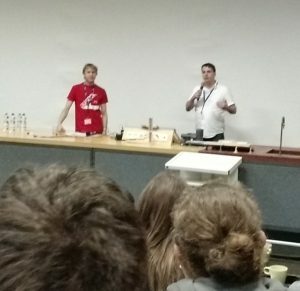 There were great technical talks that gave us insight into the goings on of multiple projects. However, I did end up missing some of the afternoon talks as I went out on a secret mission to acquire a specific garment for the AGM on Day 2. Our interns and mentors right after the lightning talks. 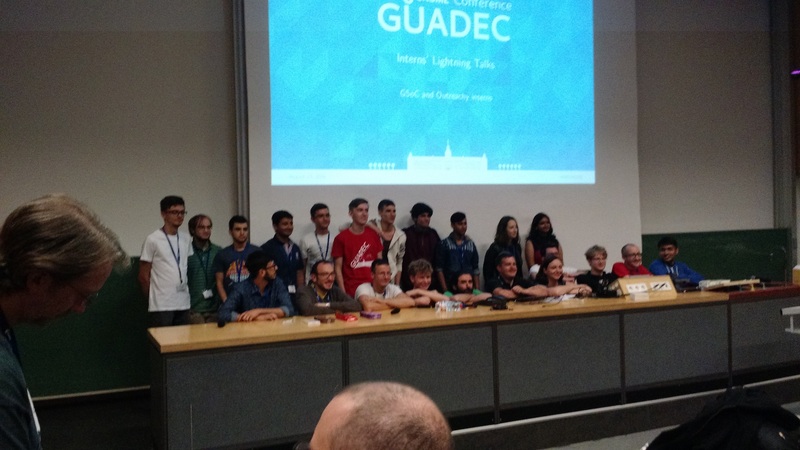 The intern lightning talks are one of my favorite parts of GUADEC. It was exciting to see what they have been working on and welcome them into the community. 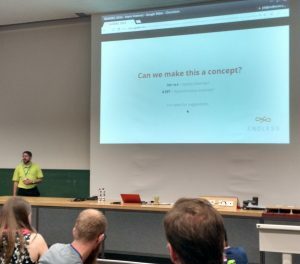 Carlos Soriano and Bastian Ilso gave a wonderful talk on the GNOME Newcomers initiative and gave ideas on how we can improve our ability to retain their interest. It is so wonderful that we as a community embrace our newcomers! We knew this would be the case before we even arrived. The GUADEC wiki contains a wonderful page full of ideas for what might interest kids in the city. When we arrived at the venue, we saw the corner of the foyer area stocked full of colorful toys and colored pencils to occupy the children. The picnic along with the games were fun for all and it was a great way to introduce the next generation to how awesome our community can be.